The Department of Beni can be full of surprises when it comes to birds. 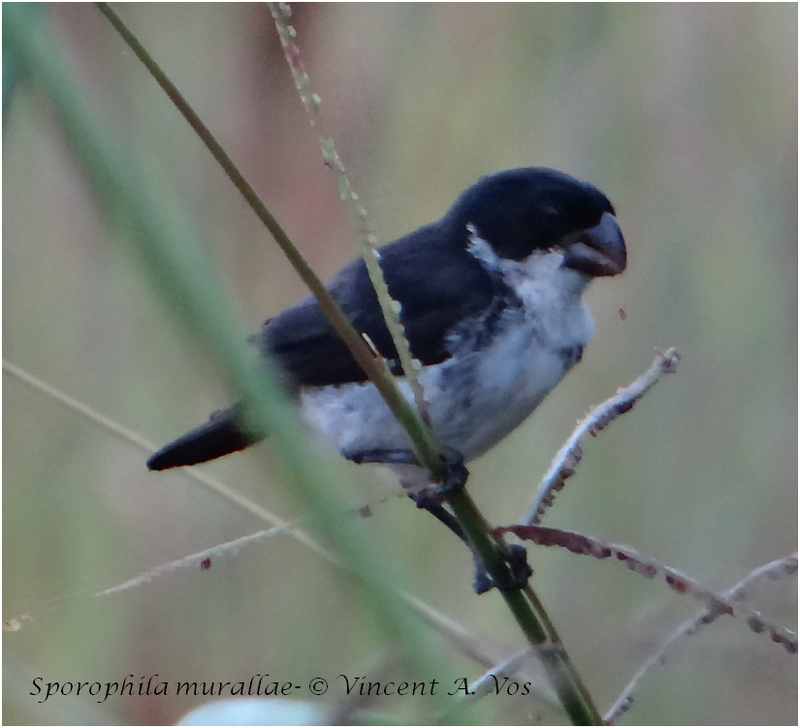 Over the past year, around the northern Beni town of Riberalta, several birders have come across a peculiar black-and-white Sporophila seedeater that has challenged their identification skills. These birds have variably been identified as Caquetá Seedeater (S. murallae) or Wing-barred Seedeater (S. americana), two exceedingly similar species that differ so slightly in plumage and size that separating them in the field is a feat for even the most experienced of Neotropical birders. 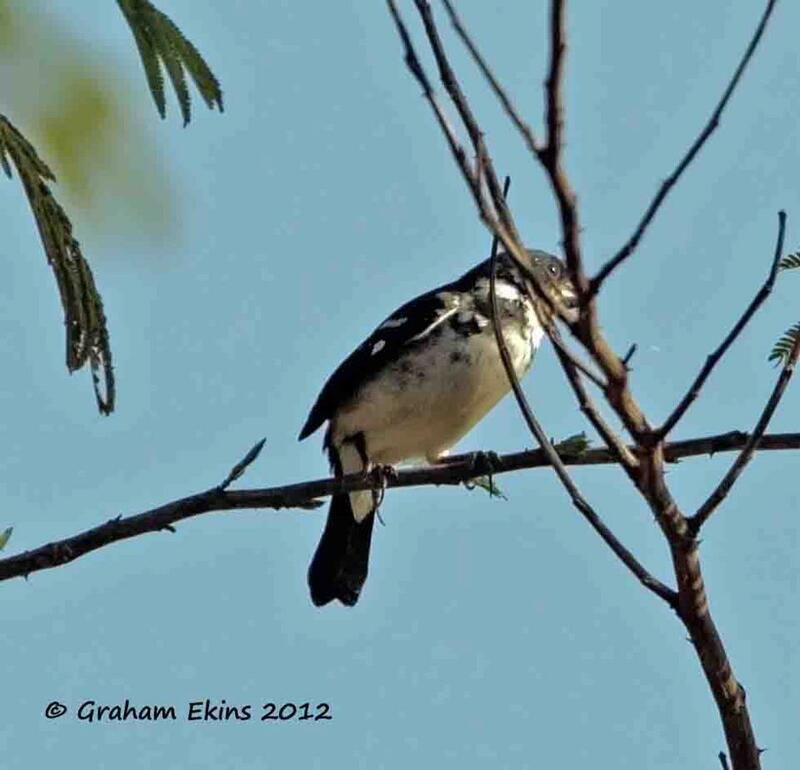 The initial discovery of the mystery seedeater by Graham and Evie Ekins and their Seriema Tours guide Hector Slongo on 29 August 2012. What makes these observations so noteworthy is the fact that the Wing-barred Seedeater is generally considered to occur in coastal northeastern South America and along the lower Amazon River in northern Brazil. The Caquetá Seedeater, on the other hand, is thought to be restricted to northwestern Amazonia in Peru (extending as far south as Ucayali Department), Ecuador, Colombia, and adjacent Brazil, with almost 1000 kilometers of Amazon Basin separating the two populations. So none of the two species is supposed to occur even close to Bolivia. Both species form part of the ‘Variable Seedeater’ superspecies complex. The taxonomic relationships between the members of this complex were last analyzed almost 20 years ago in a monographic paper by F. Gary Stiles in the scientific journal Ornitologia Neotropical. Stiles found that the Caquetá and Wing-barred seedeaters are each other’s closest relatives. Females are virtually indistinguishable by plumage, and differences between males are close to microscopic. Whereas male Wing-barred Seedeaters exhibit at least two complete but narrow white wing bars, male Caquetá Seedeaters tend to have the lower wing bar reduced or absent. However, there is considerable variation within, and limited overlap between, the two species in this character, and the number of specimens examined by Stiles is small. The second, even more cryptic difference between the two species, as pointed out by Stiles in his 1996 article, lies in the slightly longer and thinner bill of the Caquetá Seedeater. Yet, the difference is less than 1 millimeter in both measurements, so this can hardly be considered a useful character for field identification! Despite all these subtleties, the argument made by Stiles for treating these two forms as separate species was convincing – at least in the 1990s. And separating both taxa in the field was not a problem back then, as they could simply be identified by their presumably non-overlapping ranges. But the 1990s are long gone. Vincent Vos photographed this bird on 23 March 2013 on the western edge of Riberalta. Whichever one of the two seedeaters it is that has been discovered in northern Bolivia at the confluence of the Beni and Madre de Díos rivers, these observations suggest that 1990s knowledge about their distributional limits is almost certainly incomplete and underestimates their true ranges. I also don’t find it convincing that the range of the Wing-barred Seedeater simply ‘stops’ about 100 km west of Manaus, only for its closest relative to ‘pop up out of nowhere’ some 1000 kilometers farther west – with no apparent dispersal barriers anywhere in sight. These seedeaters inhabit grassy areas along rivers and lakes. The Amazon River and its affluents provide perfect habitat and dispersal routes for both taxa. And it just so happens that when it comes to birds, western Amazonian Brazil largely comprises uncharted terrain into which few ornithologists and birders have ventured. In conclusion, I have a strong hunch that Caquetá and Wing-barred seedeaters do not have disjunct distributions, but rather come into contact somewhere in western Amazonia. If this is indeed the case, their taxonomic status will have to be reevaluated. This said, I am going out on a limb here and hypothesize that geographic variation in wing bar prominence and bill size is clinal or may not show a clear geographic pattern at all. Under both scenarios, treatment of the two forms as separate species would no longer be warranted, and the Caquetá Seedeater would have to be lumped with the Wing-barred Seedeater.